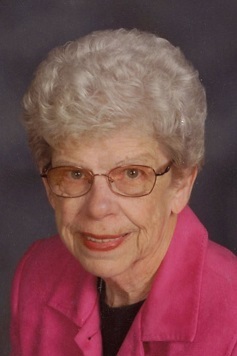 Dorothy Mae Hanson, 85, of Albany passed away on Sunday, Nov. 27, 2016, at the Monroe Manor. She was born on Dec. 1, 1930, the daughter of Carl and Doris (Williams) Hanson in Dodgeville. Dorothy was united in marriage to Arlin C. Hanson on Oct. 27, 1948, in rural Blanchardvillle; he preceded her in death in 1992. Dorothy was a 1948 graduate of Blanchardville High School. She was employed at the Monroe Police Department, as the first female officer in the city of Monroe, from 1964 to 1976. Dorothy was a member of the Albany United Methodist Church. She enjoyed crocheting, hardanger, sewing, and volunteering at the Albany Thrift Store. Dorothy is survived by her children, Larry (Jill) Hanson of Albany, Ann Krause-Hanson of East Troy, Barbara (Robert) Briggs of Albany, and Bruce (Karen Zimmerman) Hanson of Chetek; grandchildren, Melissa (Kurt) Hamilton, Matthew (Willi) Hanson, Kari (Hugh) Hoesly, Mandy (Joe) Eisch, Jennifer Hanson, Heather Stevenson, Wendy (Michael) Tomaszewski, and Kayla (Dave) Neumueller; nine great-grandchildren; and two great-great-grandchildren..
She was preceded in death by her parents; husband, Arlin; and brother, Robert Hanson. Private family services will be held at a later date. Memorials may be made to the Shriners Hospital for Children. Shriner Hager Gohlke Funeral Home is assisting the family.